Municipal bonds are a specific corner of the bond market that has its own nuances to be wary of, such as costs and tracking errors, but this pair of ETFs eliminates the guess work involved–the Vanguard Tax-Exempt Bond ETF (NYSEArca: VTEB) and iShares National Muni Bond ETF (NYSEArca: MUB). With bond market mavens warning investors of headwinds in the fixed income space like the possibility of an inverted yield curve, rising rates and BBB debt sliding out of investment-grade, investors need to be keen on where to look for opportunities. One area is within the municipal bond space, which may have gotten a boost following last November’s midterm elections. In particular, with respect to infrastructure spending—it’s one of the few things, if any, that Democrats and Republicans can agree on, but with the newly-divided Congress, this could fuel municipal bond ETFs. Still, investors need to be aware of the costs associated with investing in this fixed income space, as well as certain tracking errors that could arise with respect to their prices. 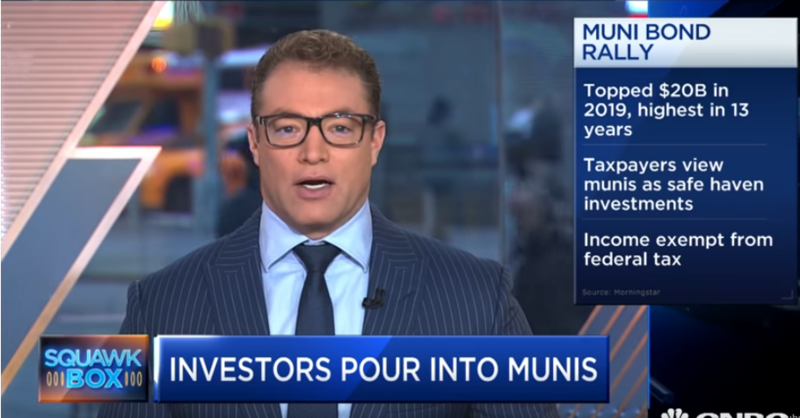 In the video below, inflows of municipals bonds in 2019 have topped $20 billion, the highest in 13 years. Analysts say taxpayers who face higher taxes because of the new cap on state and local tax deductions are pouring into municipal bonds as tax shelters. CNBC’s Frank Roberts reports.